Based on an ERC Advanced Grant ("QED-PROTONSIZE") and in addition NWO/FOM Program funding, we have 2 PhD and one Post-doc positions available. There is no deadline for applications: you can always apply until this notice is removed. Each application is evaluated individually. There are two projects, both based on testing fundamental physics using precision metrology. The aim of the first project A1 (Postdoc and PhD positions funded by the ERC Advanced GRant): is to measure the 1S-2S transition frequency of the helium+ ion for the first time using advanced laser techniques, including frequency comb lasers, ion trapping, and (sympathetic) laser cooling. This will enable us to explore an exciting new system for tests of Quantum-Electrodynamics (QED), and contribute to the solution of the so-called Proton-Size Puzzle [1-4]. Panoramic view of the new vacuum setup for 1S-2S spectroscopy in He+ (December 2017). Laura working on the Time-of-flight detector attached to the He+ setup (1 March 2018). So what is this about? Quantum electrodynamics is arguably the best-tested theory in physics. Based on e.g. the anomalous magnetic moment and precision spectroscopy on e.g. the 1S-2S transition in atomic hydrogen, it was thought that QED is basically correct. However, to compare the spectroscopy with QED calculations, one also has to take into account the effect of the finite proton size. Assuming that QED (and the independently measured Rydberg constant) is correct, the spectroscopy and theory can be used to figure out how large the proton size is. This gave a number of about 0.88 fm, which agrees well with electron-scattering experiments. However, in 2010 the 2S-2P transition was measured by the CREMA collaboration in muonic hydrogen, where the electron is replaced with a muon (which is just like the electron, but 200 times heavier). The effects of QED and proton size are much bigger in muonic hydrogen, and from the spectroscopy a 10 times more accurate proton size could be derived [2,3] (and now also the deuteron size from muonic deuterium ). However, the proton appeared to be 4% smaller (the radius is approximately 0.84 fm). So far there is no real solution to this "proton size puzzle", despite a lot of theoretical and experimental effort. One possibility could be that the Rydberg constant now in use is wrong (based on measured energy ratio's in atomic hydrogen, such as 1S-2S vs. 2S-4S). If this happens to be the case, and it needs adjustment, then the fine structure constant derived from hydrogen spectroscopy will be off. One way to find new clues to solve this puzzle would be to test QED in different systems, such as Helium+ ions. The CREMA collaboration has measured the 2S-2P transition in muonic helium+ ions (both 3He and 4He), and evaluation of the results is in progress. What we like to do is to measure the 1S-2S transition in normal helium+ for the first time so that it can be compared to the muonic helium+ measurements. Potentially this could lead to a better test of QED than the current atomic hydrogen spectroscopy, or it can be used to see if the size of the alpha particle (the nucleus of Helium+) is consistent with muonic measurements. We will use our newly developed Ramsey-comb method [7-9] that combines high-energy (mJ-level) ultrafast laser pulses with kHz or better frequency precision. One of the things to develop is extreme ultraviolet Ramsey-comb spectroscopy by combining it with high-harmonic generation. The project is quite involved, and includes frequency comb lasers, ultrafast lasers and amplifiers, nonlinear optics such as high-harmonic generation, electronics, ion-trapping in a linear Paul trap, ultra-high vacuum, fiber-laser technology, an ultra-stable laser (sub-Hz linewidth), laser cooling and sympathetic ion cooling, non-destructive ion-state readout, and much more. We have already a dedicated ULN (ultra low noise) Frequency Comb and and Ultrastable Laser from Menlo Systems available, a working Ramsey-comb laser (and we build a second one for improved performance), a source of 313 nm for laser cooling, and we are currently building up a vacuum system for the high-harmnic generation and ion-trap. In the project we work together with prof. Piet Schmidt and dr. Tanja Mehlstaeubler of the PTB Braunschweig, Germany, for ion-trapping technology and methods for ion trapping and spectroscopy. 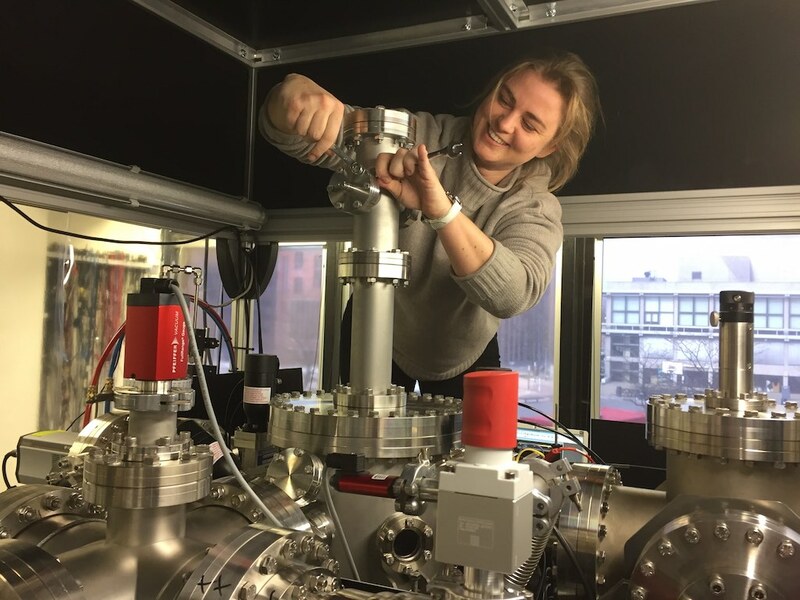 The aim of the second project A2 (PhD position, funded by the NWO/FOM Program) is to perform precision metrology on various transitions between the X-EF states in H2 to test molecular QED and also the proton size. So part of the description above is also valid for this project. Molecular hydrogen is the simplest neutral molecule, and rapidly becoming an interesting test ground for fundamental physics too (see e.g. ). The idea is to determine the dissociation energy with such a precision (we aim for about 10 kHz) that we can use it for testing QED and the proton size. The X-EF transition (using two-photon 202 nm Ramsey-comb spectroscopy in a molecular beam) is one step in this determination. By measuring different vibrational and rotational states we can also put new limits on e.g. hypothecial 5th forces. This project is a colaboration with prof. W. Ubachs and dr. E. Slumbides of our own group in Amsterdam, and with the group of prof. F. Merkt at the ETH Zurich, and theoretical support comes from the group of prof. K. Pachucki of the University of Warsaw. We have a working Ramsey-comb laser setup and vacuum setup for this project, with many opportunities to improve it! Given that many techniques are the same for both projects, there is also the possibility to be involved in both of them. Applicants for the PhD positions (either He+ or H2) should have a Master in Physics, be ambitious and highly motivated, and have significant affinity with optics, lasers, and complex experimental setups. You will be working in a team of 3 PhD students and 1-2 postdocs. The salary for PhD students will be in accordance with university regulations for academic personnel, and ranges from € 2.174 gross per month in the first year (salary scale 85.0) to € 2.779 gross per month in the fourth year (salary scale 85.3) based on fulltime employment (these are 2016 values, current salaries are a bit higher). The appointment will initially be for a period of 12 months with an extension of another 36 months that is conditional upon assessment of adequate functioning. You can be asked to spend a maximum of 10% of you time on teaching duties. Similarly, we have 1 position for ambitious Post-docs for the He+ project. Experience in ion trapping (ideally for precision spectroscopy) is particularly valued, but is experience with ultrafast lasers / optical parametric amplification and laser cooling is also very welcome. The salary for Post-doc employees will be in accordance with university regulations for academic personnel, and depending on experience is offered from € 2920 gross per month and onwards (for fulltime employment). The values are those for 2016, so now the salary is a bit higher. • generous contribution (70%) commuting allowance based on public transport. Vrije Universiteit Amsterdam is a leading, innovative and growing university that is at the heart of society and actively contributes to new developments in teaching and research. Our university has ten faculties which span a wide range of disciplines, as well as several institutes, foundations, research centers, and support services. Its campus is located in the fastest-growing economic region in the Netherlands (the Zuidas district of Amsterdam), and provides work for over 4,500 staff and scientific education for more than 23,000 students. Please include a letter of motivation, CV, and 2 names with email addresses of references.